Make Scents’ first shop was opened after a yearning to provide space for UK crafters to showcase products and also to provide local children with something to do. Almost 18 months on, things have grown slightly and we now have two shops in which we provide space and support to UK crafters as well as playing host to the most fantastic children’s parties, ladies groups, workshops, short courses and so much more. 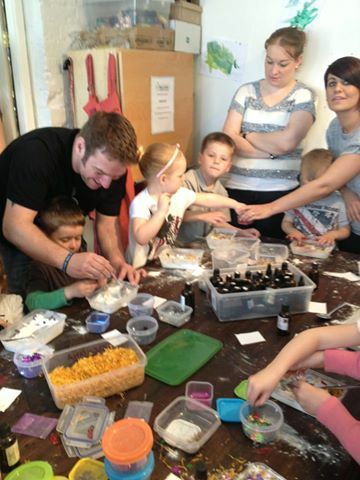 Adults can come along and learn basic craft skills, children can come along and create their own bath bombs, lip balms and even soaps and everything we do is aimed at all ages. We visit groups and clubs doing demonstrations for those less able to make their own and also run community workshops making sure we engage with as many people as is possible. Our children’s based events are very popular and our workshops, parties and kids club are usually booked up well in advance and we have even had some great blogs written about our parties and events. The most recent being a blog by a well known children’s party supplies company – which we’re particularly proud of as it was the result of the company asking their customers to nominate their best kids party experiences and I was amazed that Make Scents kid’s parties had an entire blog dedicated to just them! I hope to build on this by winning the What’s On 4 Me Award for the Best Music, Arts or Craft Activities or Events Provider category and it would be amazing to achieve this! On a final note, I’d like to say good luck to everyone who is the Voting Stage, we all deserve it! Make Scents has been nominated in the category Best Music, Arts or Craft Activities or Events Provider. To vote for Make Scents please visit the What’s On 4 Me Awards website and click the Voting Link. Kev’s Klub was established in September 2005 by Project Managers Kevin and Allison McLean. Kev’s Klub is a non-profit organisation that has been running for over seven years. They help young people over 17 years old with special needs, and their family members and carers. They give advice on practical things such as healthy eating, benefits and lifestyle choices, as well as fun, social and educational activities. Hello my name is Allison, me and my husband Kevin have both worked in the care sector since 1999 giving us a good insight into what we think clients and carer’s need to socialise. Kevin is a full time Senior Social Care Support Worker for a large Care company which is based all over the UK, with an office based in Hartlepool. Kevin is a father of 4 and grandfather to 4 wonderful children. I used to be an Activities Coordinator in an Elderly Residential Home in the town, but I had to retire due to a mobility disability. I am a mother of 2 so now have 6 between us; so as you can imagine Christmas is very busy. We live locally with my youngest daughter and Tilly the daft dog border collie. Kev’s Klub was born through a lack of things to do on a Evening in Hartlepool. We got the idea of a club because we felt there is very little to do in Hartlepool on a budget. Kev’s Klub is not a club to do things but a club to socialise and relax. Kev’s Klub is Self Sufficient none profit voluntary group that does not rely on funding, we are not backed by any governing group or company, all monies raised each week goes back into the club the following week. The centre is disabled friendly with facilities on ground level and a disabled toilet. Activities now include a variety of things to do for instance we have indoor bowls, pool, bingo, table games, dominoes, art and crafts. You can either come along on your own or with your carer depending on your needs. We offer all our carers the chance to relax by giving them free access to a Reiki session from a fully qualified Reili Master. We open 1 night a week every Wednesday 6pm-9pm based in a small community centre within Hartlepool. To vote for Kev’s Klub please visit the What’s On 4 Me Awards website and click the Voting Link. For more information about us please look at our web page www.kevsklub.webs.com or check us out on facebook.